Homonyms are words that have the same pronunciation and spelling, but have different meanings. Homographs are words that have the same spelling, but different pronunciation and meaning, also called heteronyms. 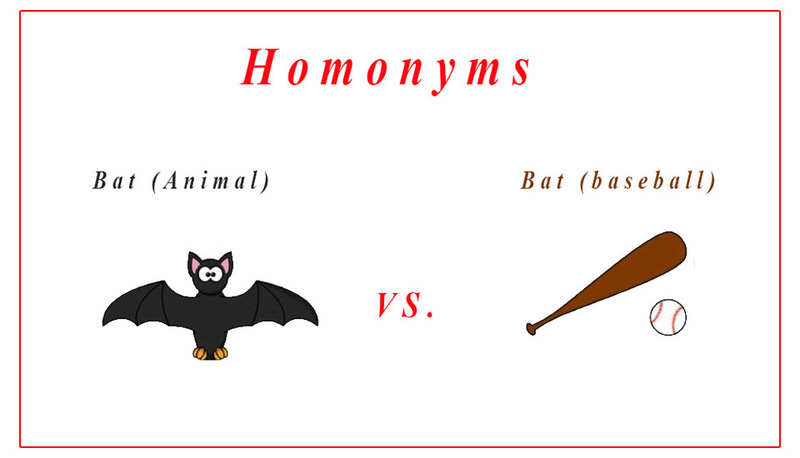 Below you can see a list of homographs/ heteronyms which are confusing for ESL learners. Learn about them to avoid common errors in spoken and written form. The words above are the most common homographs that have the same spelling, but different pronunciation and different meaning. The words which are colored in blue show the pronunciation, we recommend you to check the pronunciation of those words once at dictionary. Homophones are words that have the same pronunciation, but have different spelling and meaning. Each pairs of words above have same pronunciation, but different meaning and different spelling. Synonyms are words that are spelt and pronounced different but have the same or nearly the same meaning as another word. An antonym is a word that has opposite meaning of another word.